Gearbox has a new Brothers in Arms in development, and it's going to be published in-house. "We've had in development for some time a new Brothers in Arms game. It's authentic, its got Sgt. Baker, it's the Brothers in Arms game we want to make and we're doing it under our publishing label. I was really grateful when Ubisoft jumped in to help publish the original Brothers in Arms games but as that relationship matured, I think for them they thought the game looked pretty cool and it was sort of a side bet and it turned out to be a big franchise and it became important to their business and as that was true, they got more and more involved. I think their interests were different from what we think Brothers in Arms is. 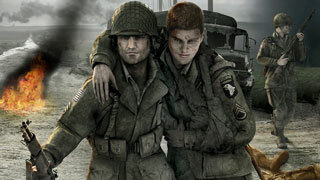 Now we can do the authentic game Brothers in Arms fans really want." "I think Brothers in Arms has always been strong because of its unique tactical gameplay, it's not just a raw shooter. There's a lot more to it than just the skill test. There's also a storytelling element, we're really pushing that to new places. Our experience working with Telltale on the Tales [of the Borderlands] series has taught us that you can actually make gameplay out of storytelling and you can have that be really engaging." There's not much more in the way of details, and it sounds like the game may still be a while out. That said, if you're a fan of the series, you can look forward to hearing more in the future.